While the calendar may still read summer, autumn is right around the corner and it is time to start gearing up for the season. By planting a few seasonal super stars now you can extend your garden’s beauty until winter’s first hard frost. Perennials – Each season has its own color palette and fall is one of the richest of them all. There are perennials that you can add to your garden now that will bolster autumn’s tapestry. Purple asters and blue salvias are wonderful color complements to the red, orange and gold foliage of the season. And if you are a savvy shopper then you know that garden centers offer end-of-the-season prices to reduce their inventory before winter sets in. This means now is the time to get some great deals on plants that have yet to shine. Ornamental Grasses – The texture and movement of ornamental grasses makes them well suited to the fall season. Look for varieties such as miscanthus ‘Morning Light’, calamagrostis ‘Karl Foerster’ and dwarf fountain grass ‘Little Bunny’. Annuals – When it comes to pumping up the color in your garden it is hard to beat annuals. You can breathe new life into your summer annuals by applying a liquid fertilizer every 7 to 10 days and cutting back those that have grown leggy. If you live in a region where warm summer weather extends well into fall, sow a second wave of fast growing annual flowers such as cosmos, gomphrena and celosia. And save room for cool season favorites such as violas, pansies and snapdragons. Container Gardens – Plan on revamping your container gardens for fall with a few “slip- in” plants. These are the plants you can add now to replace tired-looking summer flowers. Some substitutes I rely on are kale, pansies, snapdragons or ornamental grasses. Small trees and shrubs with striking foliage also a nice choice for giving your container gardens an autumnal glow. Try Virginia sweet spire, euonymus, Japanese maple, dwarf crape myrtle and fothergilla. At the end of the season, before the ground freezes you can transplant these into your garden’s flower borders. Shrubs and Trees – The true stars of the fall landscape are those trees and shrubs that produce brilliantly colored foliage. In Northern regions plant trees and shrubs in the ground well before the first frost date in your area so they can get established before cold weather sets in. Warm climate gardeners should wait until the heat breaks in the fall before planting. You will find that the cooler temperatures and more plentiful rain of autumn make the job of caring for newly planted trees and shrubs much easier. Vegetables – Like the early days of spring, the cool temperatures in fall are ideal for growing certain vegetables such as leafy greens, broccoli and Brussels sprouts. Now is the time to get out your seed catalogs and place your order for lettuce, spinach and arugula. Vegetables such as broccoli, Brussels sprouts and cabbage are better started from transplants purchased at a local garden center. In my mid-South zone 7 garden I begin planting as soon as I sense that the heat is about the break, which is usually late August to mid-September. When determining your planting date and selecting crops for your vegetable garden, you need to know the number of days it will take for a plant to mature and the first frost date of the season. You might think the best way to know when to plant is to take your average frost date and backup the number of days until maturity. But this doesn’t take into account the cooler and shorter days to come. It’s actually better to come up with an imaginary harvest date a few weeks before frost and back up from there. I remember vividly the first time I tasted a husk cherry. It was more than a decade ago while shopping at the local farmers market with my young daughter. One of the farmers had a small basket of papery lantern shaped fruits on his table. I asked if they were tomatillos based on their appearance. He was happy to offer us a generous handful of husk cherries to taste while he told us all about these interesting fruits. Painted pumpkins are an easy and popular alternative to carving the traditional jack-o-lanterns. And the Toad pumpkins, with their small shape and interesting “warts” will add even more whimsy to your designs. Toad pumpkins are easy to grow from seed, have a bright orange color and will need approximately 85 days to grow to maturity. They weigh between 1.5 to 2.5 lbs., which is the perfect size for a project with children. The more water you give it, the more warts it will produce! You can purchase Toad pumpkin seeds from my Home Grown Seed Collection. The end of summer is when all work in the vegetable garden really starts to pay off. Warm season crops like corn, tomatoes, watermelon, and eggplant are ready to harvest. And the zucchinis! They seem to be everywhere! There are a lot of vegetables growing at Moss Mountain Farm and I’m getting pretty good at recognizing the signs that indicate something is ready to harvest. I thought you might like a few pointers as well. Click a fruit or vegetable below to reveal its harvesting information. First-year asparagus gardens should not be picked. Removing the spears weakens the plant while it is still trying to get established. So after the first year, harvest asparagus when it is about 3/8-inch thick and 6 to 8 inches high. Be sure to cut the spears below the soil line, about an inch, to prevent pests and disease. Sadly, fresh asparagus does not keep well. Soon after harvest, it begins to lose sugar content and becomes fibrous. If you cannot prepare your asparagus immediately, trim the stem ends about 1/4 of an inch, wash and pat dry and then place the stalks upright in a glass of water. Cover them with a plastic bag and store in the refrigerator. Asparagus will stay crisp this way for about 3 or 4 days. Cantaloupe is ready to harvest when it pulls easily from the vine. The area around the stem may also appear cracked. Smell is also a good indicator. If the melon smells fragrant and musky, it is ripe. Store unripe melons in a cool, dry location and move them to the refrigerator once ripened. Corn can be tricky to gauge because there are several variables that determine how quickly it matures. The days to maturity listed on the back of the seed pack is a good guide, but you also need to factor in your climate and whether the variety is open pollinated or hybrid. Sweet corn has a fairly narrow window when the flavor is at its peak. I’ve always been told to watch the silks, once they turn brown or black it is time to harvest. In addition, the tip of the ear should feel round, not pointed, and punctured kernels should pop, producing a milky liquid. Corn should be eaten as soon after harvest as possible, but it can be frozen to use in soups and other recipes. Cucumbers are best picked before they are fully mature. Gather pickling cucumbers when they are 2 to 6 inches and slicing cucumbers when they are 6 to 10 inches. Pick in the early morning before the day gets hot. To help retain moisture take an inch of stem along with the cucumber. To keep the plant producing it is important to remove over mature fruits. Cucumbers placed in a loose bag will keep for 3 days in the refrigerator. Harvest when 3 to 5 inches long or 4 inches diameter. The skin should be glossy. Cut a bit of stem as well. As with most fresh vegetables, it is best to use eggplant the day it is harvested but given modern day schedules, this is not always feasible. You can store eggplant for about 3 days in the refrigerator. Pick okra frequently because it matures quickly, especially during hot weather. It only takes about 4 days for it to go from flower to harvest time. The pods should be tender, about 2 inches long and easy to cut with a knife. Remove old pods to keep the plant producing. Cover your skin when harvesting to protect yourself from the irritating bristles. Keep okra in the refrigerator for 2 to 3 days. Store in the crisper in a perforated bag. Do not wash okra before storing because wet okra will mold quickly. Browning of the pods indicates that they are past their prime. Hot peppers can be picked at any time. Sweet or bell varieties need to mature on the plant. These are ready to harvest when they are 3 to 4 inches long, are firm, and have even color depending on the variety, either green, red, purple, orange, or yellow. Dry or pickle hot peppers for storage. Bell peppers will keep unrefrigerated for two to three weeks. the ground in a shady spot for a day to dry. Don’t cure in the sun as this will make them turn green. Early potatoes can be stored unrefrigerated. To store potatoes long term (5 – 10 months) first cure for 1 – 2 days, then store in a single layer in a dry, cool, dark place. can tell a pumpkin is ripe if you hear a hollow sound when you thump it. Pumpkins are usually ready to harvest by mid-fall. Bring them in before the first frost or when night temperatures are expected to drop down into the 40s for an extended period of time. Gently clean the pumpkins by brushing off any excess dirt and then place them in a dry, warm area for 7 to 10 days. This will heal scratches and further harden the rind, which helps reduce moisture loss. If a frost is expected cover the pumpkins with a frost blanket overnight. After they have been cured keep your pumpkins in a cool location (about 50 to 60 ° F), out of direct sunlight with plenty of good air circulation. Stored this way, they should last up to 3 months. Gather summer squash when they are young and tender, about 4 to 5 inches in length. Old, large fruits with tough skins should be removed from the vine and thrown away. This will encourage more flowers and fruit. Patty pan squash is ready when it is 3 – 4 inches in diameter and the skin is still soft enough to puncture. With the exception of Hubbard, squash should be cut with about 1-inch of stem. Pick snap beans while they are young before the beans become visible inside the pod. All beans including snaps should be harvested continually to promote more bean production. Harvest early in the day after the dew has dried on the leaves. Beans will keep for 3 days in a plastic bag in the refrigerator. Do not wash before storing because wet beans will decay quickly. You can also freeze snap beans. Blanch before freezing. Tomatoes should be uniform in color and firm. During hot weather tomatoes soften quickly, so pick them often even if they are slightly immature. If a killing frost is predicted go ahead and bring in the green tomatoes. Those that have started to lose their chlorophyll will ripen off the vine. They will be light green to yellow in color. Immature green tomatoes can be used for relishes and chow-chow. Store ripe tomatoes unrefrigerated. Green tomatoes can be kept in a paper bag with an apple to ripen. The apple produces ethylene gas, which speeds up the ripening process. When the curly tendril opposite where the melon is attached to the vine turns brown and shrivels that’s the sign it’s time to harvest the melon. The underside may also turn a cream color and the skin will be dull and tough. Store uncut watermelons at room temperature. They will keep for about 2 weeks. Cut pieces will keep, tightly wrapped in plastic, in the refrigerator for 2 or 3 days. The rind of winter and autumn squash should be hard and deep in color. You should be able to press into the skin with your fingernail and not leave an indention. Harvest in early to mid-autumn before the first hard freeze. Gently remove any dirt and set the squash in a warm, sunny location to cure. It usually takes just a few days for the skin to harden and any scratches to seal. Store them in a cool, dry location in a single layer with a bit of space between each squash. Like summer squash zucchini should be harvested while young and tender although the fruits should be about 6 to 8 inches long. Old, large fruits with tough skins should be removed from the vine and thrown away. This will encourage more flowers and fruit. Place unwashed, in a plastic bag in the refrigerator. Use in 2 to 3 days. It hardly seems logical to discuss fall planting when summer is just getting underway, but it’s the right time to begin your plans for an autumn garden. Ideally gardeners should start preparing for fall right around the summer solstice, if not before if you live in an area with a short growing season. In most areas planting should take place from July through August to allow for plenty of time for seeds and plants to grow and mature before the first autumn freeze. The average date of the first killing frost in your area is the most important thing to know when it comes to fall vegetable gardening. Your local garden center is a good source of information for this date. To determine when to start planting, find out the number of days to maturity for the vegetable. Next, count back the number of days from the first average frost date. Some people add a week or so to allow for a few extra days to harvest the produce once it’s mature. You will find maturity information on seed packets and some plant labels. Most everything you plant in spring you can grow in your fall garden, too. These are cool season plants, meaning they will tolerate a light frost, thrive in short daylight hours and perform best with mild temperatures. Some vegetables even taste better when nipped by a light frost. Broccoli – Broccoli seedlings should be planted 10 weeks before the first frost date in your area. This means planting them during the last hot summer days so it’s important to mulch around them to help keep the ground cool and moist. Feed the plants 3 weeks after transplanting into the garden. Use a low nitrogen fertilizer. 70 days to maturity. Brussels Sprouts – Brussels sprouts are ideal for fall gardens because they really taste best when allowed to mature in cool weather. In my mid-South garden, summer comes too quickly to grow them in the spring garden. Set the plants out in mid-summer. It will take about 3 months before the sprouts appear. They are ready for harvest when they are firm and green. 90 days to maturity. Cabbage – Plant seedlings 6 to 8 weeks before the first frost. If the heat of summer is still intense when it’s time to plant in your area, give the young plants protection from sun. Cabbages are heavy feeders that require fertile soil rich in organic matter and consistent moisture. 70 days to maturity. Cauliflower – Plant seedlings 6 to 8 weeks before the first frost. Cauliflower can be tricky to grow. Rich soil and consistent watering are the keys. Fluctuations in temperature, moisture and nutrients can cause the plant to “button” or produce small, undersized heads. Blanch the heads by tying the outer leaves together over the heads when they are about 2 to 3 inches across. This keeps them from turning green and becoming bitter. 60 days to maturity. Kohlrabi – Kohlrabi is a member of cabbage family, but it looks and tastes similar to a turnip. The bulbous edible portion grows just above the soil line. Shade young plants from summer sun. 40 to 60 days to maturity depending on variety. Lettuce – Sow seeds in late summer. Provide the seedlings with consistent moisture and shade from the afternoon sun. 45 to 60 days to harvest depending on type and variety. Mustard Greens – Sow seeds 6 weeks before the first frost. Seeds will germinate in soil that is 45 to 85 degrees F. Keep the soil consistently moist to encourage rapid growth and tender greens. 45 days to maturity. 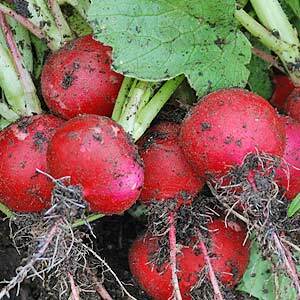 Radish – Sow seeds for radishes 4 weeks before the first frost. Winter varieties such as China Rose, mature slower, grow larger and store longer. They should be sown about 6 weeks before the first frost. Sow the seeds evenly so you don’t have to thin them. No feeding necessary, but soil should be fertile and well drained. They are quick to mature so check them regularly. They are ready to harvest as soon as they are of edible size. 25 to 50 days to maturity depending on variety. Spinach – Sow seeds 5 weeks before first frost date. The short days and cool, moist weather of fall is even better for spinach than spring. An established spinach crop will last well into winter and can survive temperatures down into the 20s. 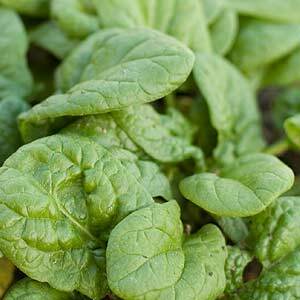 Spinach prefers very fertile soil to encourage rapid growth and tender leaves. 45 days to maturity. Wondering what to plant in your vegetable garden this fall? How about favorites such as lettuce, broccoli, spinach and cabbage. They love the cool fall weather. Here’s a planting plan based on the framed beds in our city garden. The square beds are 4′ x 4′ and the triangles are 6′ long and 3′ tall. Don’t worry if you do not have this exact configuration. Scale the plant quantities to suit your garden. Getting the kids back to school and heading to the lake for the long Labor Day weekend aren’t the only ways we kick off autumn. Planting cool weather crops such as lettuce, broccoli and spinach is also an activity that signals the advent of the season. Many gardeners don’t realize that the end of summer doesn’t signal the end of home grown vegetables and herbs. There are quite a few things we can grow during the cool, short days of fall. Here are eleven of my top favorites. You can harvest leafy greens just a few weeks after planting. Find out the first frost date in your area and compare it to the maturity dates of plants. This will help you determine what and when to plant. Use cold frames and frost blankets to extend the growing season. This centerpiece is a combination of cut marigolds, fall foliage and spicy red peppers. It is a bright color combination that is sure to make a splash at your next gathering. Cut a hole in the top of the pumpkin that is large enough to fit the vase through. I find it handy to trace the diameter of the vase on the pumpkin to use as a guide. Remove the seeds and pulp from inside the pumpkin. A jar lid makes this task much easier. Set the pumpkin aside. Now you need to make a floral frog. This can be done easily and inexpensively with a piece of chicken wire. Simply crumple the chicken wire into a ball and secure it to your vase with floral wire. Set the vase with the chicken wire floral frog into the pumpkin. Add water to the vase and you are ready to begin arranging your flowers. First you want to establish the framework of the arrangement by inserting the sedge and bittersweet. You can purchase bittersweet at the florist. If you don’t have either of these plants anything tall and spiky will do. I also like to use things such as wheat, ornamental grasses, liatris or salvias. Next fill in with the round and full marigold blooms and peppers. Again, you can substitute with what you have on hand. As a finishing touch add the alternanthera leaves so that they drape over the rim of the pumpkin. Other options are goldenrod, sprigs of ivy, and hyacinth bean vine. When I place the pumpkin on the table I encircle the arrangement with a few sprigs of bittersweet. This morning I noticed the autumn dew collecting on the grass. The sunlight shimmering on the blades reminded me that it is time to turn my attention towards lawn care. Taking a few simple steps now will ensure that my grass goes into winter with everything it needs to emerge lush and green next spring. Here are a few tips for preparing your lawn for the upcoming season. Most plants don’t need feeding at the end of the summer, but turf grass is an exception. An application of fertilizer at this time promotes strong root development – good news for your grass as we head into winter. For cool season grasses (northern states) spread fertilizer in early September. Feed warm season grasses (southern) in early September and mid-October. Follow the manufacturer’s instructions and water thoroughly after applying. To do my part to reduce chemical runoff I like to use an organic lawn food, especially one that is phosphorous-free. If you dislike mowing as much as I do, then you know the inclination to lower the mower blade in the fall is strong. I tend to think that if I cut the grass down to the roots I’ll be done mowing for the year. For a healthy lawn, resist this temptation and continue to cut your grass to about 2 inches tall. It is also best to remove the grass clipping because cool, wet weather can turn them into mush. If you have problems with moss or mushrooms in your lawn, fall is an ideal time to apply agricultural lime or dolomite to improve the pH and prevent these two problems. If you have bare patches in your lawn or wish to establish a new lawn, mid September is the time to sow grass seed. Check with your local county extension service for the best type for your area. Be sure to purchase top quality seed and prepare the soil by tilling and working in organic matter. Keep the area adequately moist while the seeds germinate and get established. When reseeding spots within the lawn choose a seed variety will match the existing turf in color and texture. This is a great time of year to create a new lawn or re-sod an old one. You just want to give your new lawn plenty of time to acclimate before it gets too cold. To prepare the area first kill any existing grass or weeds with a nonselective herbicide. Once the vegetation has died, till the area to loosen the soil. Sod will root best in moist soil so gently shower the area with water before you put down the grass down. It is easy to forget to water during the fall but you should keep the area consistently moist until the grass gets established. Wouldn’t it be nice if fallen leaves insulated grass from cold winter temperatures? Unfortunately leaves left on the lawn are not helpful and can actually be harmful. It is important to remove dead leaves because over time they will form a dense mat that smothers your grass. So get out the rake, add the leaves to your compost pile and keep reminding yourself all the great rich soil that will come from your efforts. Our lawns benefit from an occasional loosening up, so to speak. Over time the soil gets compacted and thatch builds up. Thatch is un-decomposed grass roots and stems that collect and compound, weaving a mat around the blades of grass. To check the level of thatch in your lawn dig down about 3 inches deep and remove a piece of turf. What you will see is a brown root like material sitting between the soil and the green grass. A thin layer of thatch, less than 1/2 an inch, is good for your lawn. It increases durability, prevents weeds and retains moisture. Anything over this amount needs to be removed. If you have a small lawn and less than 3/4 of an inch of thatch, you can remove it by simply raking it up. If you have clay or highly compacted soil you may need to go the extra step of aerating your lawn. Be sure to do this before the end of September. It will take about 3 weeks for the grass to recover from the process. To aerate your lawn you can either rent a machine, hire a professional or, if you are working in a small area use, a pitch fork. Push the pitchfork into the ground at a 45 degree angle about 4 inches deep. Then rock the fork back and forth to loosen the soil. My best advice about weeds is to know your enemy. Is it an annual, biennial or perennial? Apply a pre-emergent now to prevent annual weeds and a post emergent later in the season to kill annual weeds that escaped the pre-emergent as well as perennial and biennial weeds. One of the best ways to knock down many perennial weeds such as dandelions, clover and ground ivy is to use spot applications of herbicide. These types of unwanted plants are taking in nutrients to create food and storing it in their roots for winter. Herbicides applied in the fall go quickly to the roots right along with the nutrients. Fungi often thrive during the cool and moist autumn weather. Diseases such as Brown Patch, Take-All Root Rot, Snow Mold or Fusarium Patch are prevalent during this time. Check with your local garden centers for the best treatments in your area.